NEW BRITAIN - Bruna Vila Artigues walked away as the hero for CCSU women’s basketball after her buzzer-beating 3-pointer rattled in to beat Bryant 66-65 Saturday afternoon, but one of the unsung heroes behind the Blue Devils’ surprising comeback was positioned at the rim when Artigues’ shot went up, waiting to jump on another rebound. 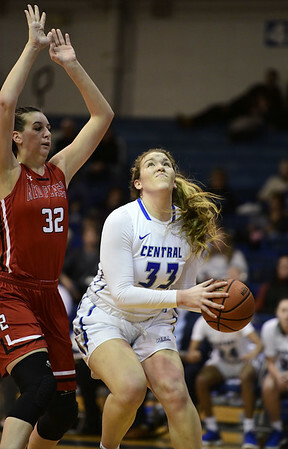 Sophomore Ashley Berube rushed Artigues after the game-winning shot went down, but CCSU just as easily been swarming Berube after her performance on Saturday, as the center finished with 17 points, 11 rebounds and five blocks to help erase the Bulldogs’ 13-point second half advantage. They were crucial for CCSU (6-13, 3-6 Northeast Conference), which needed an edge in the paint against a Bryant team ranked second in the NEC in offensive rebounds and overall rebounding margin. But Berube refused to back down on the boards, fighting for every loose ball and disrupting every Bryant shot attempt within 10 feet. In the second half, Berube scored on back-to-back possessions to cut the Bryant lead to six, after shooting 4-for-5 in the first half to keep the game from getting out of the Blue Devils’ reach. Saturday’s performance was the apex of what has been a steady climb for Berube, who averaged just under three points per game as a freshman to having just recorded double-digit points for the 11th time this season. Berube’s success has come in multiple different roles so far this season, as Piper has plugged her into the starting lineup while also calling her name off the bench. So far, whether Berube’s been on the floor or in a seat at the opening tip, it hasn’t marked a change in her performance. It has made things a lot easier on Piper, who has found another source of scoring outside of Kiana Patterson. Berube has given the Blue Devils an inside presence that can clean up baskets on the offensive end, while playing defense like she did on Saturday, helping hold the Bulldogs to just 36.9 percent shooting. With each passing game, Berube’s confidence grows along with her point and rebound totals, leading to expanded roles on the floor. Berube credits her newfound confidence to extended work in the gym, working on her shooting craft through the offseason and into conference play, where she is averaging 9.6 points per game. Of course, her contributions stretch far beyond the scoring column. On both ends of the floor, Berube’s impact was felt on the team’s most thrilling victory of the season. The ball wasn’t in her hands on the final possession, but as usual, she was right where her team needed her to be. Posted in New Britain Herald, CCSU on Sunday, 3 February 2019 21:36. Updated: Sunday, 3 February 2019 21:38.